When your use of a brand spans your entire lifetime to date, you know it's a brand you can trust. While my memory doesn't go back that far, Mama Butterfly tells me I suffered from severe heat rash even as an infant, and when she checked with the doctor about what to do, instead of a prescription for something chemicals laden and bad for any skin, nevertheless an infant's, the Doctor recommended she use Aveeno® products on my skin and she tried it and it worked like a charm. So my first introduction to the brand goes back a long way! She was impressed with how well my skin responded to the products then, and it still works just as well for me now, my skin thankfully is not as sensitive now as it was then, but it is acne prone and like most skin, reflects bad habits like lack of sleep, poor eating habits, or sensitivity since I test out a wide variety of products. But my Doctor's advice then, still holds true now, use products on your skin that you can pronounce ALL the ingredients for. Botanical: LUPINE - essential amino acids are found in this plant! Water Repellant: LOTUS - in this instance the use of Lotus repelling water is a GOOD thing, it helps the sunscreen formulas to adhere to your skin even when it's wet so you have continuous sun protection. Sometimes it's what NOT in a product that speaks volumes! Natural ingredients soothe your skin so you end up feeling not only softer and smoother, but you can combat redness, irritation and protect your skin's moisture barrier! This is where science meets nature to make products that are good for your skin! You know how much I love sharing affirmations and meditations, so today repeat after me 'I affirm that I deserve and have beautiful, youthful and healthy skin!'. I start with the Skin Brightening Cleanser in the morning and then the apply the Tinted Moisturizer with SPF 30 (as I lost my Auntie Butterfly to skin cancer, products that protect from the harmful UVA/UVB rays is incredibly important to me! ), at night I remove any makeup with the Cleansing Pads (one side is gently textured so it will help to mildly exfoliate your skin, and the other is soft and has foaming skin cleansers and natural soy extract), and then on alternating nights in addition to removing makeup with the pads I will also use the skin brightening daily scrub. (Cleansing Pad Tip: I like to take along a few of the cleansing pads in a clear plastic bag, they are great pre gym workout to help you remove any foundation so you don't sweat the makeup into your eyes which burns!). Do something good for your skin each and every day and trust me when I tell you that you use less makeup when you have a good skin regimen in place! Eligibility: Join the party by participating during the hour using the hashtag #AveenoActiveNaturals, and your own original tweets, re-tweets will not count as entries. You must answer giveaway questions correctly during the party to be eligible for all party prizes. NOTE: I am not a host or co-host, please direct any questions regarding this twitter party to the hosts directly! 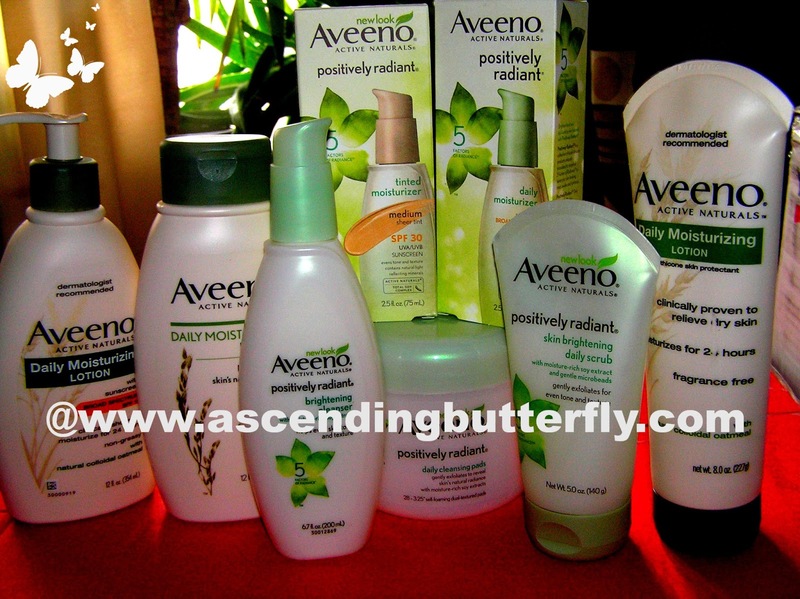 Butterfly, What is YOUR Favorite Aveeno® Product? FTC DISCLOSURE: This Sponsored Post is in collaboration with Latina Bloggers Connect and AVEENO® - All products featured were provided to Ascending Butterfly free of charge for our editorial consideration. All opinions are 100% my own.